Get in touch with us to learn more about how Publishing Perspectives can raise the visibility of your events, titles and services during the Frankfurt Book Fair. Why Choose Publishing Perspectives Show Dailies? 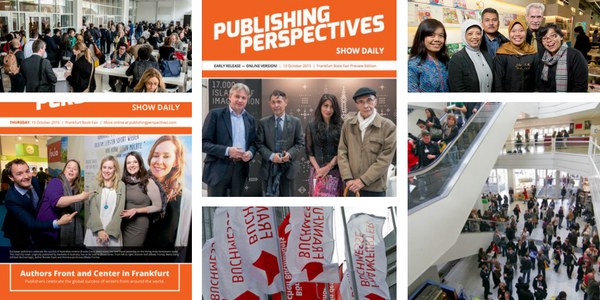 Publishing Perspectives‘ show dailies in Frankfurt offer you the best opportunity to promote your titles, services or business to the global publishing community. Our print magazines offer high-visibility ad spaces, as well as sponsored content opportunities. To best reach Frankfurt attendees, we recommend combining print and digital promotion for extra impact. In addition to the options listed below, Publishing Perspectives offers specialized print promotion, sponsored editorial coverage, and custom advertising packages. Please get in touch with us to discuss how we can help you reach your marketing goals.